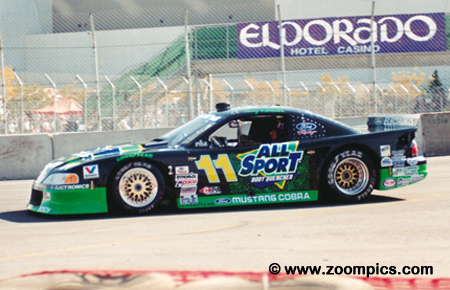 The 1997 Trans Am season was all about Tom Kendall. He set a number of records on the way to his fourth Driver's title. 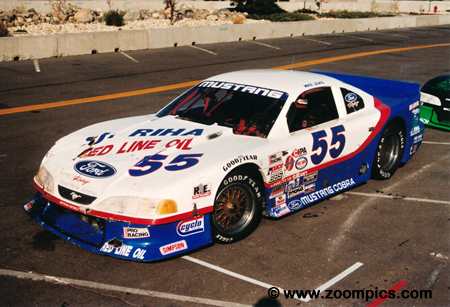 He swept the first eleven races of the 1997 Trans Am championship and clinched Ford's eleventh Trans Am Manufacturer's Championship. He also became the first driver to earn over $1,000,000 in Tran Am purse money. 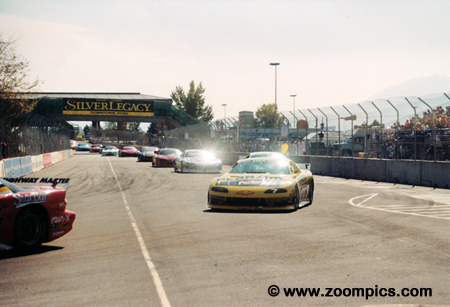 The thirteenth and final race of the 1997 season took place in Reno, Nevada. A temporary circuit was setup using the parking lot of the Reno Hilton. It was a very tight track - 1.27-miles long with 11-turns. 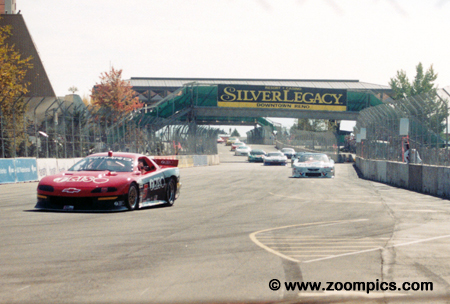 This was the second consecutive year the Trans Am series competed at this venue. Unfortunately, the event was not profitable for the Hilton and the race was not conducted the following year. 1997 was a good year for Tom Kendall. He had secured the Trans Am championship long before the season finale. But the final round was not kind to the new champ. Kendall qualified fourth behind Gentilozzi, Schroeder and Simo but a series of pit stops contributed to his seventeenth place finish completing 65 of the 75-lap event. He did have the satisfaction of turning the fastest race lap. The final full-course yellow ended with 3-laps remaining. At the drop of the green Paul Gentilozzi jumped into the lead but he tangled with Brian Simo's Mustang causing the pair to spin. The incident allowed Mike Borkowski in a Mustang to inherit the lead and take his second career Trans Am win by a 1.069-second margin. Borkowski grabbed Rookie of the Year honours and finished third in the championship. The damage to Brian Simo's Ford Mustang Cobra appeared to be mainly cosmetic. 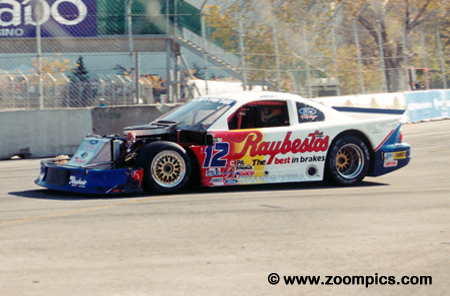 But the incident with Paul Gentilozzi forced him to retire 3-laps from the end. This dropped him from a podium finish to ninth. However, Simo was able to maintain him second place in the championship. Gentilozzi was able to continue after the incident and finished fourth. Jon Gooding in the No. 16 Ford Mustang out-brakes the Camaro of Max Lagod going into turn seven. Lagod was able to get by Gooding before the end of the race. The late race incident between Gentilozzi and Simo allowed the eighth place starter to finish a career-high second. Gooding who qualified sixth finished in eighth on the lead lap. The No. 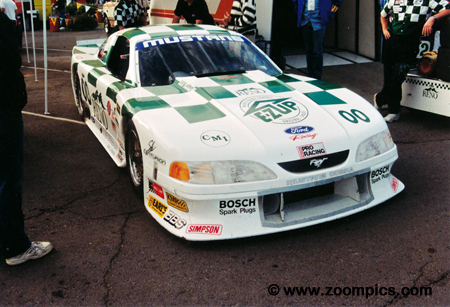 00 Ford Mustang was driven by local racer Rick Lee. Lee was a successful Sports 2000 competitor who won the inaugural Reno Grand Prix in 1996 and finished second in American City Racing League championship that same year. 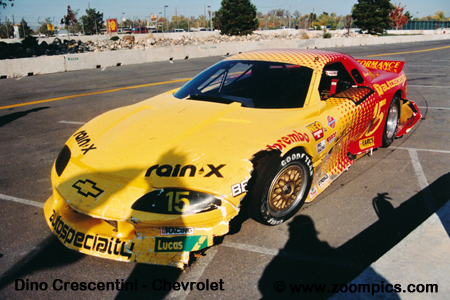 At the 1997 Trans Am event he qualified seventeenth and finished a very credible fifth. Twenty-eight starters took the green flag for the season finale. However, the tight and twisty circuit took its toll on the field. A total of nineteen cars were running at the finish with eight drivers still on the lead lap. Here RJ. Valentine leads a group of cars into turn seven during one of the full course yellows. Valentine finished seventh after starting tenth. 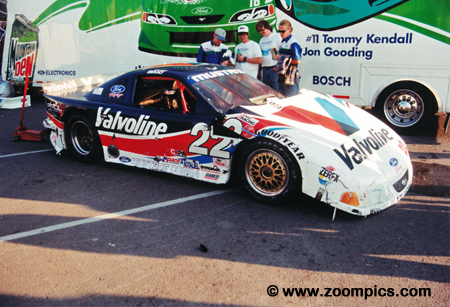 It was a difficult race for 1989 Trans Am champion Dorsey Schroeder. A first lap incident forced him to pit the No. 12 Ford Mustang. At the checker, he was 15-laps behind the leaders and classified in twenty-first. 1997 was not one of Schroeder's better Tran Am seasons. He finished fifth in the final standing with six podiums but no victories. Michael Lewis' Mustang sits in the pit lane after the race. Like many of his fellow competitors his race was not without an incident. A crash meant that he completed only 67-laps and was classified in sixteenth after qualifying fifth.